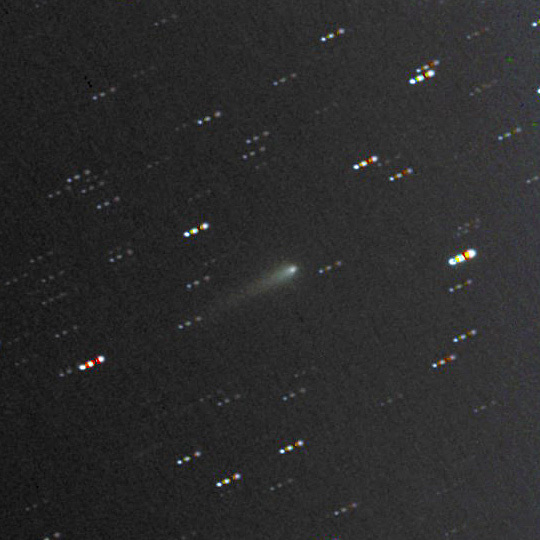 Here are the first few pictures of Comet ISON taken over the weekend from my internet operated remote observatory in the Sierra Nevada Mountains. The first picture was made with three, two minute exposures each of Red (R), Green (G), Blue (B) and Clear or Luminance (L) filters. 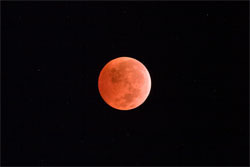 Each of the color frames are stacked into a final 6 minute master image for that color. When this is completed for each filter, the 4 channels are combined into the final color (LRGB) image seen below. 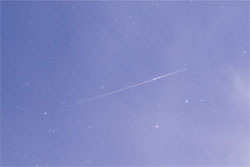 The stars in the picture are dotted lines because the telescope was tracking the comet instead of the Earth’s rotation. 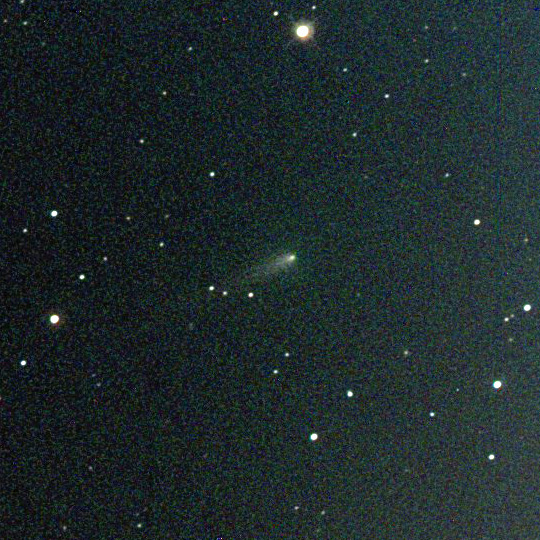 After about ten minutes of time the comet’s visible location changes relative to the star field causing the individual stars to trail. Here’s an LRGB image consisting of a single two minute exposure for each color frame. The stars are not trailing in this image because the entire image was taken within 8 minutes which was not enough time for the stars to noticeably move. 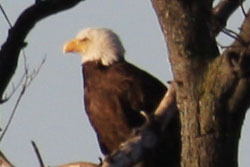 There is a lot more noise in this image (it is grainy) because of the shorter exposure time. Below is a longer exposure from September 21st totaling 48 total minutes of exposure time. The way some people are talking, Comet ISON could be the comet of the century by the end of this November, but nobody really knows for sure just yet. For good reasons, the comet community has been a bit apprehensive about hyping up the comet any more than it already has been, mainly because they don’t know for sure what’s going to happen. 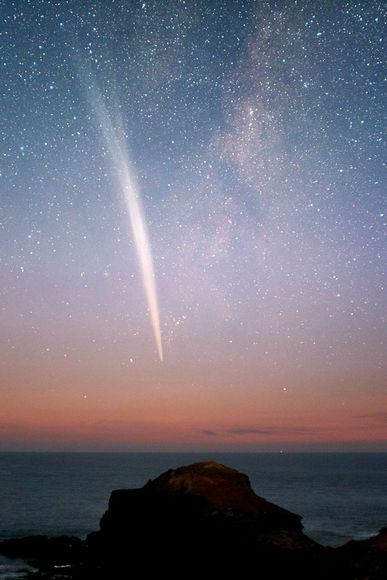 Its possible the comet could light up half of the early morning sky this December, but its also possible it could break apart and melt completely on its journey around the sun which starts this Thanksgiving Day. 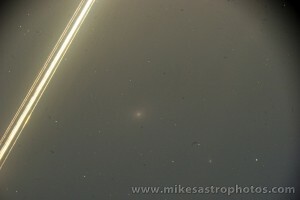 There are a few things about this comet that make it interesting. 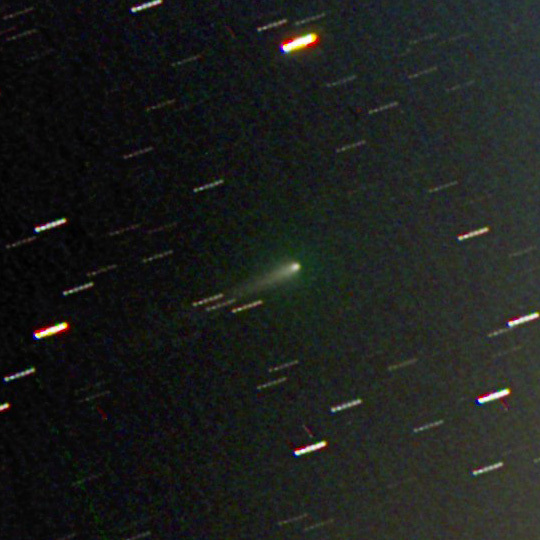 First its what astronomers call a ‘dynamically new comet’. This means the comet has never visited the inner solar system — this is its first trip around the Sun. Therefore the materials and elements that comprise the comet have never been heated past a boiling point. This is the first time in modern history a dynamically new comet has flown past Earth giving astronomers using spectrographic cameras an opportunity to analyze the elemental composition of the comet — something that has never been done before on a dynamically new comet. Comet ISON is also what they call a ‘Sun Grazer’. This means the comet’s orbit puts it close enough to the sun that it will literally fly through the outer Corona. If this voyage does not complete destroy the comet, it will leave it with a significant tail that could stretch half of the sky. See the pictures of comet love joy, a similar sun grazer that was visible from the southern hemisphere last year. If ISON can make it past the sun, we should expect a light show that is comparable or better than comet love joy. Of course, this comet could be a total dud and that’s why the professionals are being cautious. They don’t want to get people’s hopes up and then look silly if the comet falls apart. Comet ISON will be coming close to Earth on Dec 30th, but there is no fear of any danger at .42 AU (1 AU is the distance of the Earth to the Sun). 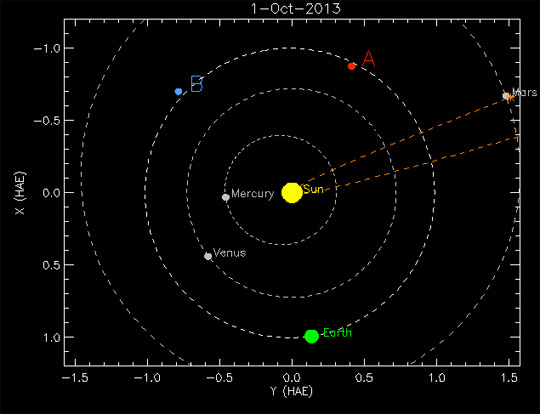 Mars however will have a front row seat for the ISON fly by at just 0.07 AU. By mid January, Earth will be crossing the comet’s orbital path (the part of it before it went around the sun). 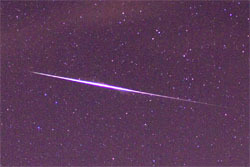 Its still not certain but its possible we could have a new meteor shower associated with the comet. 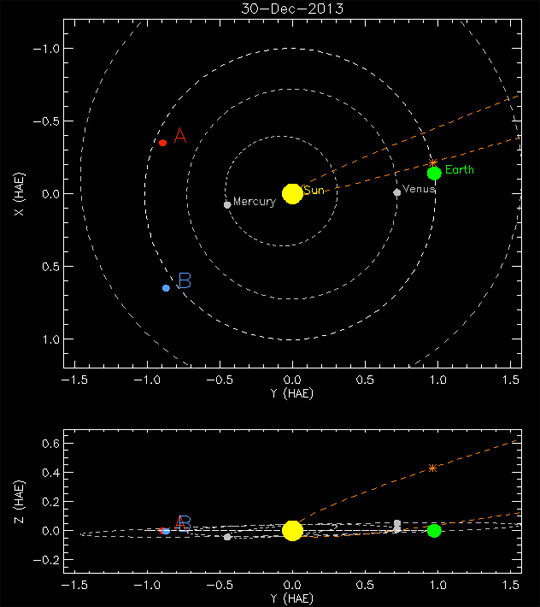 Here’s an image of the comet’s orbit and location when it has its closest fly by past Earth on December 30th, 2013. Around January 15th, the Earth will pass through the comet’s orbital path and we ‘might’ see a meteor shower. 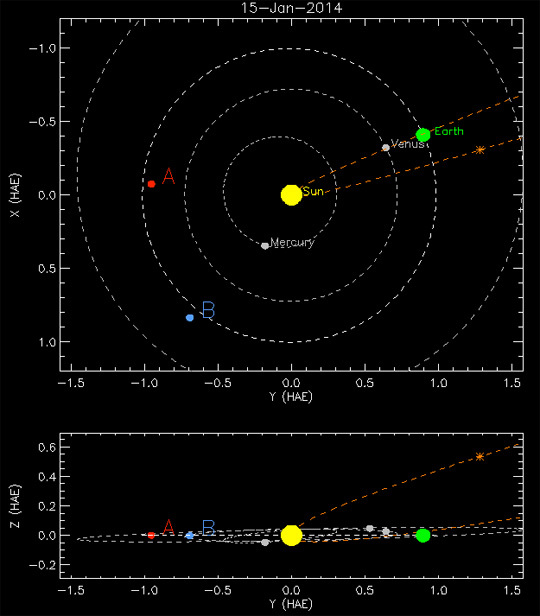 If you want to take a look at an interactive orbit model for Comet ISON check out this really cool ISON Orbit app built by NASA. Some people ask, where does the comet come from, why has it never made it to the inner solar system, how long did it take to get here and how fast is it going. Space is a big place. Our solar system is a big place. Our inner solar system is a big place. BUT when you compare the distance between the Sun and Pluto, and then look at that distance relative the the Oort cloud (our outer solar system), you will be amazed at how small the planetary part of the solar system is compared to its outer regions. 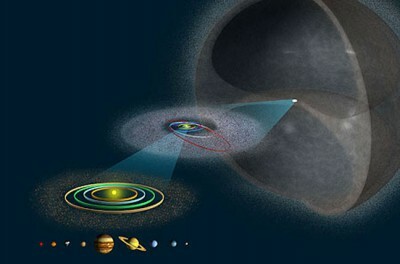 Take a look at this image of our solar system all the way out to the Oort cloud to give some perspective. ISON is an Oort cloud comet. If all goes well, and Comet ISON survives its passage around the sun, we might be able to see something like this in the morning skies leading up to the new year. Of course if it melts around the sun, we won’t see anything.